Prior to today, if you broke something on your Pixel phone and you wanted it fixed through an official channel, you'd have to go to the widely-known uBreakiFix or Puls (a phone repair startup). An in-house mail-in repair service, dubbed 'Repair Center,' has just been added to the Google Store. So if you want Google itself to fix your Pixel, you're now in luck. The landing page for the Repair Center includes some links to Google support pages showing how to prevent or potentially fix whichever problem you're having at home. Of course, that isn't going to be much help if your screen is already cracked or you've drowned your phone. To get started with the repair, you're required to enter your phone's IMEI, at which point you'll be presented with a variety of options. Should your phone still be under warranty and have some sort of issue that wasn't caused by accidental damage, the site indicates that the repair will be free. 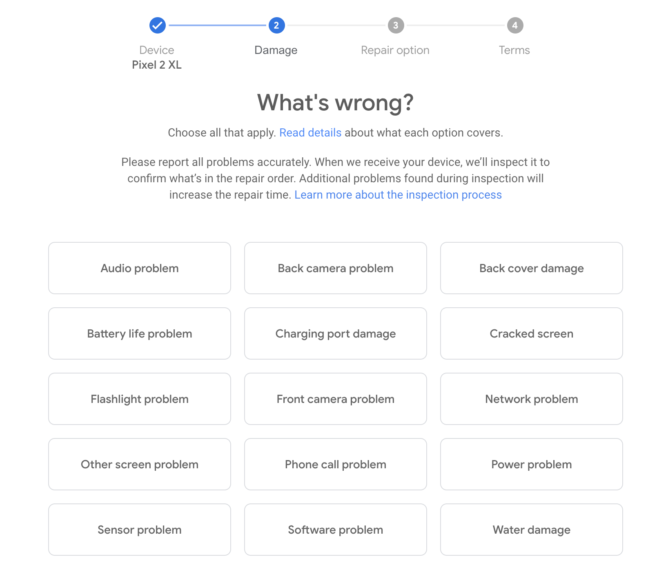 If, however, your problem isn't covered under warranty (a cracked screen and water damage will likely cover 95% of these cases), Google will give you an estimate for the repair. For a Pixel 2 XL, a cracked screen will cost $239, and water damage (even though the 2 XL is IP67-rated) will run you $413. Both of those figures are before tax, though Google will cover shipping and even offers to send some prepaid packaging to you at no charge. The repair will take around 7-10 business days after the phone is shipped. Right now, the Pixel, Pixel XL, Pixel 2, and Pixel 2 XL are eligible for this, though the Pixel 3 and Pixel 3 XL will obviously be added once they launch. We wouldn't be surprised to hear a mention of this new Repair Center in the announcement. This is US-only for now, and Google notes that the option "might not be available" for some (though it doesn't explain what criteria that's based on).